This delicious bowl is fully balanced with a creamy lemon sauce. Bowls are some of the most versatile meals you can make. Essentially they are a balance of protein, vegetables and carbs, but they can really be anything you want. The keys to a great bowl are: flavour and colour. 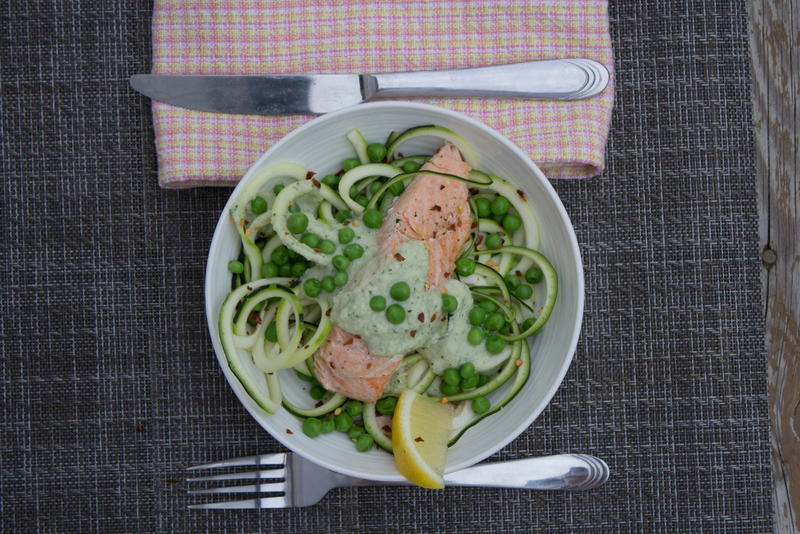 The following recipe is nutritious—filled with Omega-3 fatty acids, vitamin C and more! Enjoy! Process cauliflower in a food processor until it forms a mealy consistency. Fill a saucepan with one inch of water and bring to a boil. Cook the processed cauliflower for four minutes and strain through a fine mesh sieve. Return the cauliflower to the food processor and combine with the other cream sauce ingredients. Meanwhile, heat the oven to 375° and place salmon on a large sheet of tinfoil. Dress with salt and pepper, olive oil, two slices of lemon and smashed garlic. Fold the tinfoil into a packet and cook on a baking sheet for approximately 20 minutes. Cook peas for two minutes in boiling water and strain. Run under cold water immediately to retain the peas’ bright green colour.